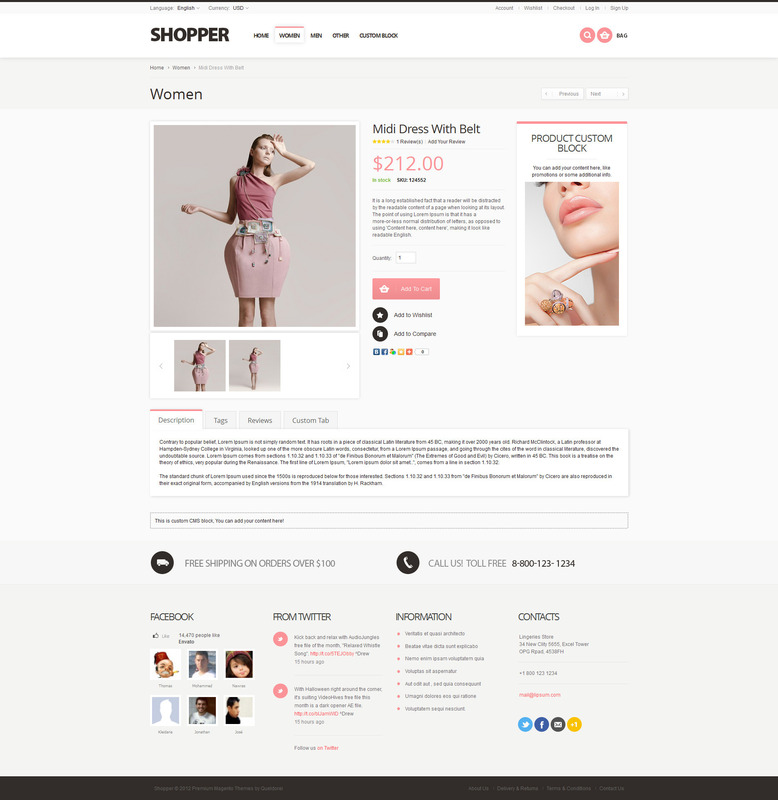 Shopper – is an extremely powerful and flexible premium Magento theme with responsive & retina ready design. 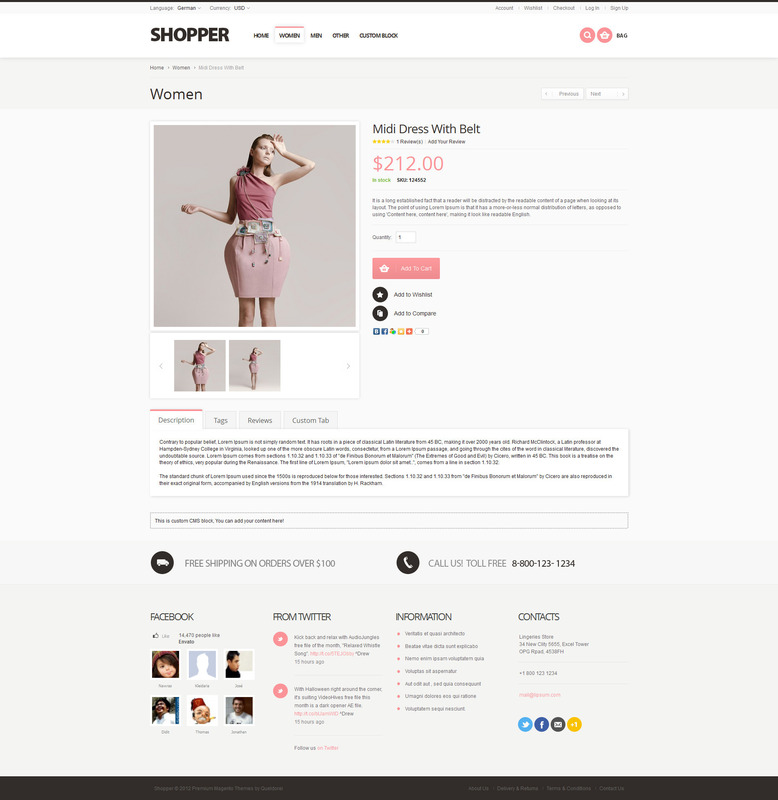 This theme is perfect for any type of store and comes with lots of awesome features, such as: ajax price slider, custom grid modes, revolution slider, quick install package and etc. Simply check features list below. Control every pixel of your theme. 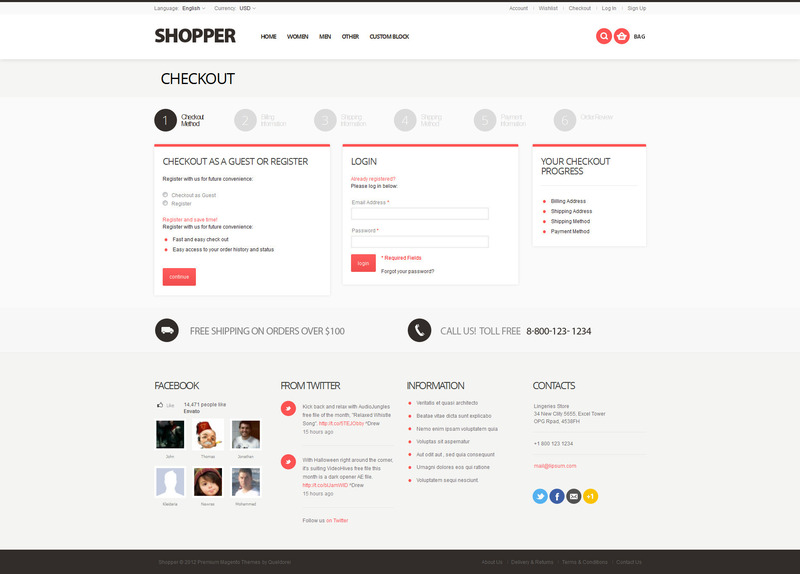 Make every category of your webstore look special. We included quick start package, so you can eaisly install theme with the same look as on our preview. Ajax shop by price slider. You can now adjust price range with a fancy slider without refreshing a page. You can add products to cart, wishlist and compare without leaving current page. 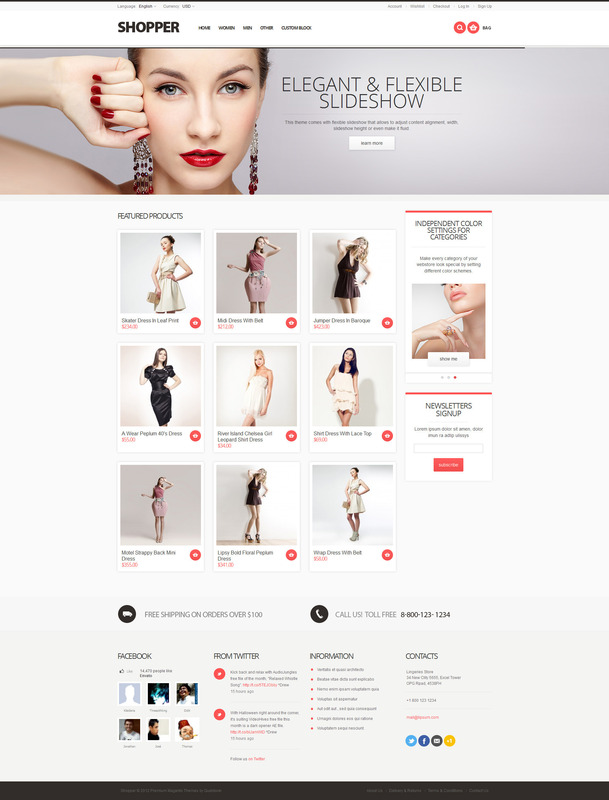 Front page made using static cms page and it comes in too layout variation: full width or with sidebar. You can set how many items to show in column and it will be automatically divided to approriatenumber of columns. for buttons, titles and page heading. You can now have a small slideshow for your promotions in sidebar. You can set columns for sidebar through admin panel. This theme comes with flexible slideshow that allows to adjust content alignment, width, slideshow height or even make it fluid. Also you can change transition effects, speed, timing, etc. You can set fluid height for slideshow, so it height will depends on each slide image height. Slideshow comes with touch navigation for mobile. You can set slideshow to be displayed on every store page. 3per row and sidebar or 4 per row without sidebar. 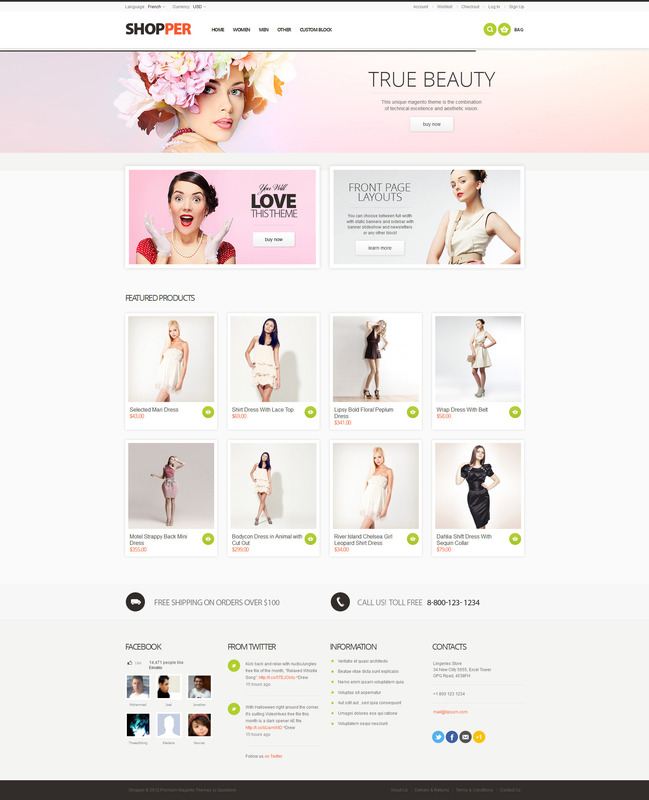 Product page comes with two custom cms blocks. 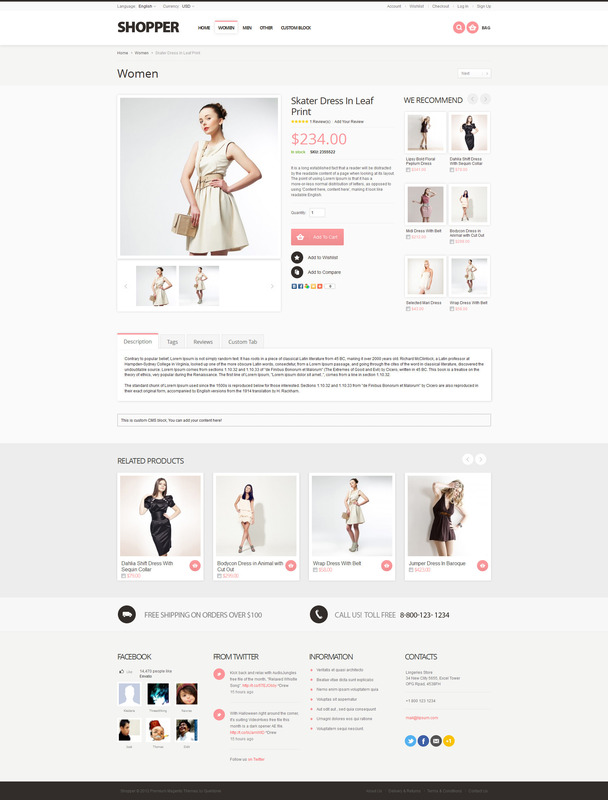 Full widht layout, with recommended products slider, or custom content like banners. 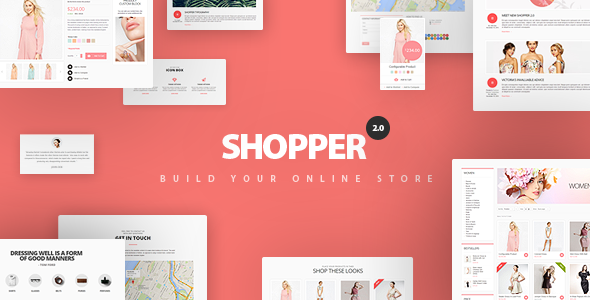 Slider for Up-sell Products and Related Products blocks. 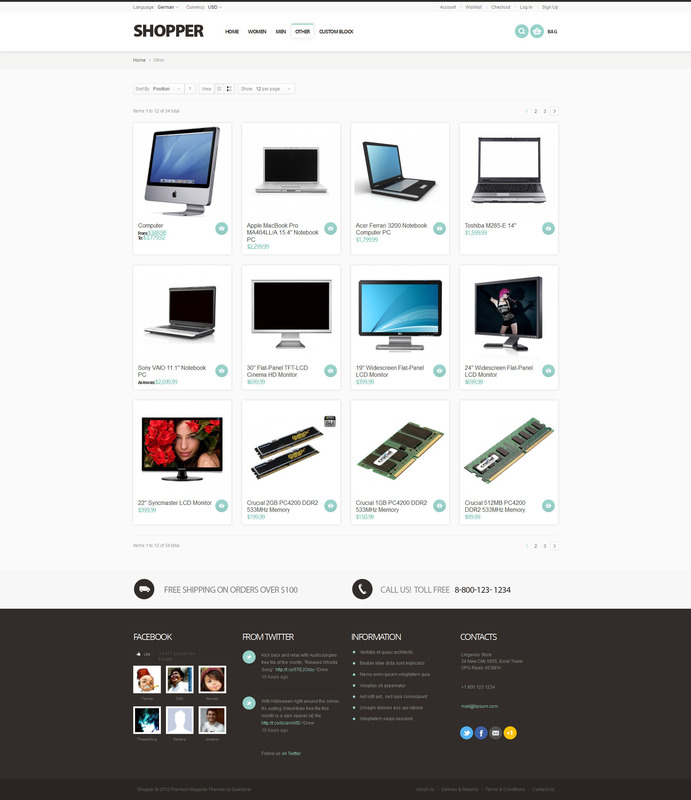 Now you can show as much related and up-sell products as you want. Custom tab for product page, ready to display any content: info about shipping, returns, sales, etc. Custom block for drop-down menu. Now you can display your custom content as a drop-down block in navigation. Static block for Logo image. No need to upload your logo using ftp client anymore, now you can change from admin panel. 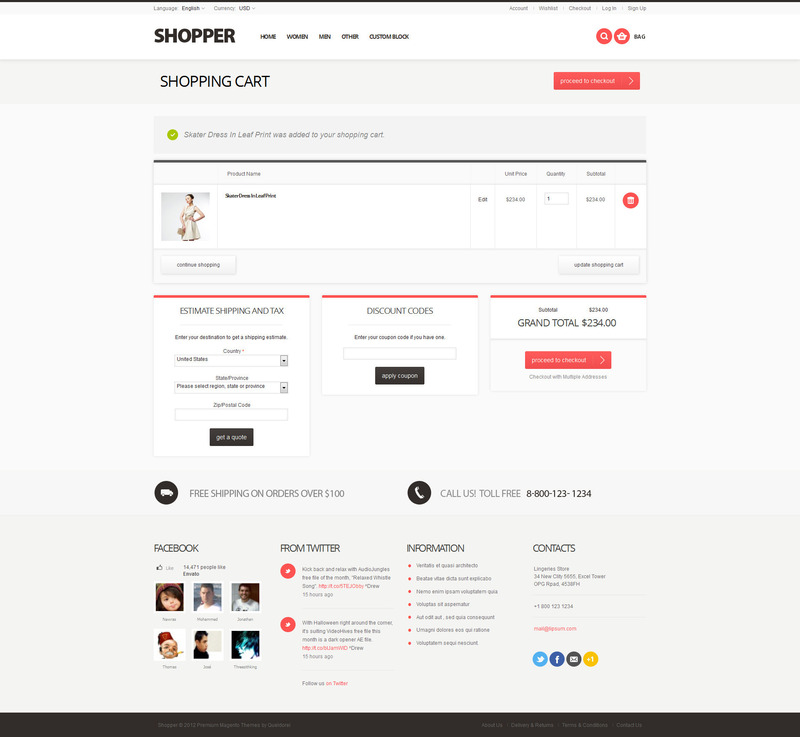 Previous & Next functionality for the product view page. Now you can navigate to next and previous products without going back to listing page. You can now add home page button in the main navigation menu. Get social with Latest tweets & Facebook fan box in footer. ?Sign Up? link in the Top Links block. 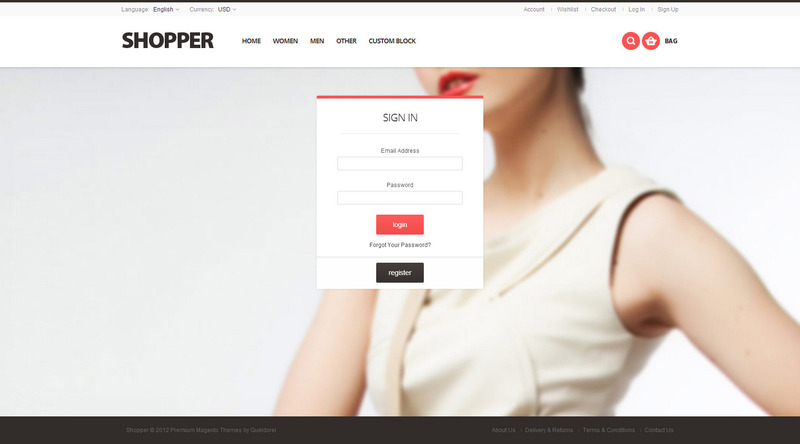 It will help new customers to find the registration form. Product labels (?new? and ?sale?) on product page, in categories and on other product listings (editable from admin panel). option allows you to view product details without leaving current page. We provide extensive support & keep our themes up to date. We’ve made FAQ section to help you with some common question, that you can encounter while setting up magento theme. Images from preview are not included in theme files.